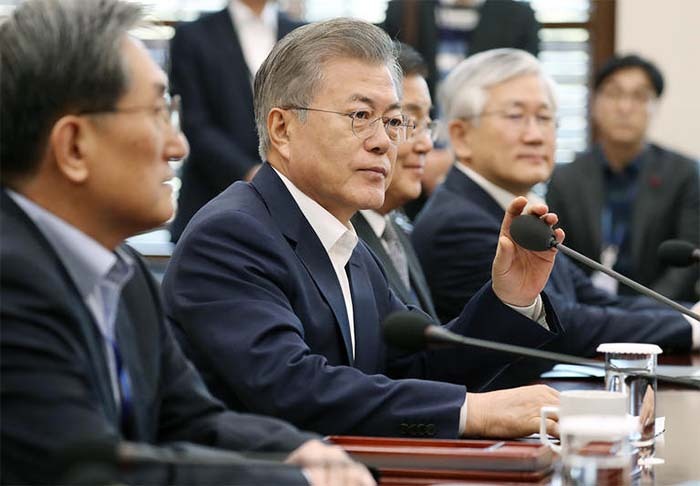 President Moon Jae-in on Monday said the second U.S.-North Korea summit late this month will be "an important turning point that will help complete denuclearization on the Korean Peninsula." Moon added the summit will also forge "a new North Korea-U.S. relationship, and a peace framework on the peninsula." He was speaking at a meeting with senior staff at Cheong Wa Dae. "Making use of this opportunity that has been given us for the first time since the national division will pave the way for building a future with no threat of war and achieving economic prosperity through peace," he said. "I hope that the summit will be a historic one that will turn the Korean Peninsula from an area of Cold War hostilities and conflicts to a zone of peace and prosperity." "It's true that there are still a lot of misgivings about denuclearization and the peace process of the Korean Peninsula," he added. "There are even a large group of people who seem to want to see the era of hostilities and conflicts continue." But opposition parties and experts are worried that the U.S. and the North will cut a deal that backs away from full denuclearization and leaves South Korea exposed to the nuclear threat from the North.